Love is in the air this month at Twisted Grove. We can’t think of a better way to celebrate Valentine’s Day than with a sweet dessert for two. Whether you like sweet or savory, all-things chocolate or prefer a piece of pie, we’ve got you, and your sweetheart, covered. Also known as “pan tres leches,” this light and airy sponge cake is soaked in three milks; evaporated condensed milk, sweetened condensed milk and heavy cream. 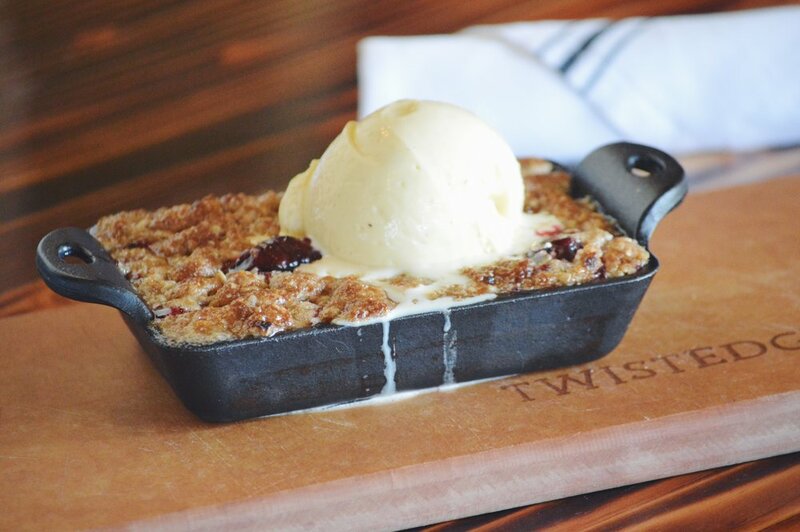 At Twisted Grove, ours is served with salted caramel, whipped cream and fresh berries. And it makes for a sweet ending to any meal. Chocolate lovers, rejoice! This decant dessert is for you. Whether your date is a chocolate lover, or you both are, this dessert dish is sure to be a hit this Valentine’s Day. A chocolate brownie crust and luxardo cherry drizzle make it even more delicious. A classic that can’t be missed, our Butterscotch Pecan Pie is award winning. Find out why -- hint, it might the candied pecans or tasty whipped cream -- and try it for yourself. Not just any ol’ cookie, our chocolate chip cookies are baked with chocolate chunks and sprinkled with sea salt. The chocolate milk makes a nice pairing. View our full menu here. Contact us with your reservations. Call us or book online.